The Majerhat Bridge in South Kolkata connects Behala to the rest of the state capital. This bridge was used by many in their daily commute. During rush hour on Tuesday September 4, a 66 foot section of the bridge deck collapsed. The collapse took down multiple vehicles with it. Officials have confirmed 24 cases of injury with three fatalities. The injured were taken to either SSKM Medical College and Hospital or CMRI Hospital after they were pulled from the rubble. Biker Soumen Bag lost his life in the bridge collapse. He was crossing the bridge, falling headlong into the wedge created when the deck split into two. Chief Minister Mamata Banerjee told sources that there was a hut under the bridge where construction workers used to stay and that “had they been there during the time of accident, an unfortunate thing might have happened”. Since the incident, two men were unaccounted for. The bodies of Goutam Mondal and Pranab Dey were found under the debris from the collapse. Dey and Mondal were laborers from the Murshidabad district. Governor of West Bengal, Keshari Nath Tripathi, called for an investigation, as the cause of the collapse is unknown. Tripathi told reporters that “the bridge deserved better maintenance”. Before the collapse there were complaints about the soundness of the structure of the concrete. 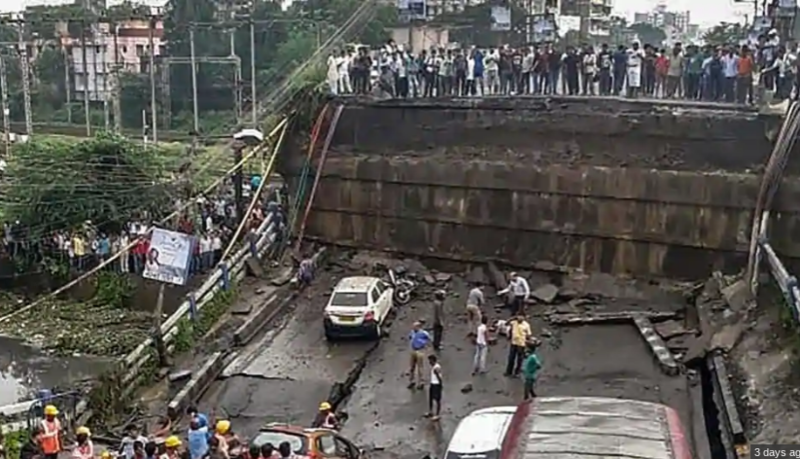 The 50-year-old bridge is the second major bridge collapse in India this year and the fifth biggest in the past two years. The most major collapse being Veranasi, which was much more fatal. Veranasi collapse left 18 people dead. A government survey was conducted in 2017, showing that 23 of the national highways were over 100 years old, 147 needed immediate repairs and 6000 were experiencing structural issues.